Lesley Shand funeral directors in Corfe Mullen has been nominated for a prestigious award and is up against major brands including Marks and Spencer and Heineken UK. The funeral business is part of Dorset’s Douch Family Funeral Directors and was put forward by MP Michael Tomlinson. Corporate Responsibility Group that has listed 20 companies from across the country. Its scheme was introduced in 2015 to encourage MPs to take a closer look at companies in their constituencies and consider the extent to which they are operating responsibly. Lesley Shand is a long-standing business in Corfe Mullen and has always made a point of being more than a business. Indeed, its premises are currently being rebuilt and will include facilities that will benefit the whole community. Nick Douch, managing director of the group, said: “For one of our branches to be listed alongside some major brands is quite something. “There is a great team at Lesley Shand who work hard not just for the business but for the community. “Across the group we try and do our bit; whether that is sponsoring sports clubs, leagues and events, holding bereavement group sessions, organising community functions or doing charity work. “Like Lesley Shand many of our branches have been around for a long time and we feel it is our responsibility to help in the community which we have served for so long. MP Michael Tomlinson said: “I am delighted to have nominated local funeral directors Lesley Shand for this award. Baroness Greengross, who sits on the group, said: “The idea of nominating a Constituency Responsible Business Champion is clearly catching on. Douch Family Funeral Directors have been helping families with funeral arrangements for over 100 years. 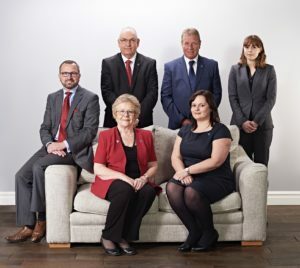 Branches include Douch & Small, A E Jolliffe & Son, Albert Marsh, James Smith, Ives & Shand and Lesley Shand Funeral Service. They’re based in Ferndown, Wareham, Poole, Upton, Wimborne, Swanage and Corfe Mullen.